Earlier this week we received the final detailed specs of the Galaxy S10 trio. The most premium among those will be the Galaxy S10+'s top edition with its 12 GB RAM and 1 TB internal storage and that exact phone ran a couple of benchmarks. 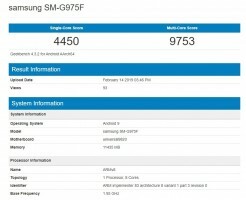 AnTuTu and Geekbench listed a device with the model name SM-G975F, which is the global variant of the phone, and the results it reached, were extraordinarily high for an Android smartphone. Single-core performance is about 20% higher than the result the Galaxy S9+ yielded a year ago. Multiple cores going steadily over 9000 is an improvement too - a result that can be matched only by a Kirin 980 chipset in the benchmark-dedicated "performance" mode. The AnTuTu final score of 326,185 includes CPU, GPU, UI, and memory tests. At the beginning of the month, the Chinese benchmark posted its monthly Top 10 Fastest Android smartphones, and the nubia Red Magic Mars was way ahead of everyone else with over 320,000. Once the Galaxy S10+ is official on February 20, there will be a new contender for the top spot.